i have her for the past 6 months, she his highly distructive such has making holes in the wall ripping the linoleum certain areas when its fix she return 2 or 3 occacion to the same spot rip the linoleum she was a gift. she has toys, i walk her 2 times a day, we live in a large 3 room apt she has access to be free.my gran kids in a few days will staying a short while with us age 7 years 3 years. Total German Shepherd: The shedding is normal - best described, when your GSD loses its coat in clumps it is when German Shepherds lose their undercoat - this is called blowing coat. 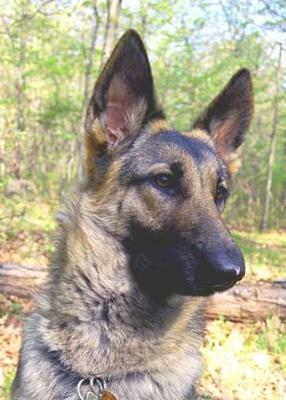 And concerning the behavior problems - your German Shepherd is bored - and not getting enough exercise. 2 walks a day are no where near enough exercise for an 11 month old German Shepherd puppy. And if you don't provide enough exercise and/or training your German Shepherd puppy will find other ways to use up all that pent up energy - and often times it is in a destructive manner. Give the German Shepherd puppy more exercise - play with her a lot more - wear her out and you'll have far less behavior problems. And last but not least - don't forget the dog training either. This is such an important part of owning a German Shepherd. They are incredibly intelligent dogs and need a job. These dogs don't come pre-trained. Sign up for a puppy training class ASAP - it'll be the best money you ever spent - but if you want to do it yourself - check out the dog training banner above from a really good dog trainer on the internet. Good luck! Also, I think that crating a puppy dog is important while they learn how to behave properly. I have a 4 months old GSD. He is full of life and used to be quite destructive. But I bought him a large crate before I brought him home. The crate is filled with teething toys, balls, stuffed animals so that he can play when he is in his crate. He gets walked a lot during the day and he also spends time in my backyard. He is crated when he is in the house. He loves his crate and considers it his home. When we bring him in from being outside, he goes straight to his crate where he plays, relaxes or sleeps.